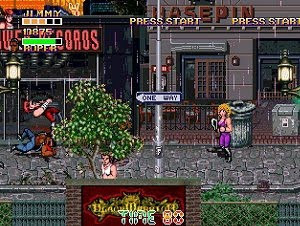 Double Dragon III: The Dragon Stone is a free action game created with OpenBor and will absolutely marvel fans of old school beat’em ups. The Double Dragon is a classic franchise published by Taito and The Rosetta Stone was the last “big” name in the series. The Dragon Stone is a fan made installment that features great graphics in the same style that made the series famous, along with the spectacular gameplay. Brothers Billy Lee and Jimmy Lee, along with Sonny Liu will run across several dangerous streets and fight against all kinds of bad guys. There is an option for co-op multiplayer up to three players, something that really increases the adrenalin in the game. The author also introduced many new moves, combos and special attacks to keep things interesting and fresh. The Dragon Stone is an impressive creation and a free PC game that shows how fan remakes should be made, despite a few bugs here and there that should be corrected in new versions.